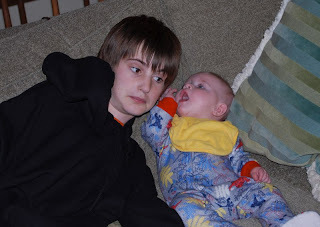 Fourteen years ago today the young man you see here (getting a secret told to him by his baby cousin :)) came into my life. The journey of parenting has thus far been both the most difficult and rewarding of my life. I've shed more tears than I can count, been frustrated and angry, been bursting with pride, and am still continually amazed at how much love I have for this child. He was born into a troubled marriage that did not last past his third birthday. He's lived in several places, went to several schools, and has had several parental figures come in and out of his short life. He's dealt with new life, death, divorce, and known failure. He's also known success, forgiveness, grace, and peace. That's a lot for a fourteen-year-old who'd really rather pick up his dad's guitar and play 'Kryptonite' or plop down on the floor next to his dog and play something on the Playstation. He's brilliant, clever, fun, sarcastic, energetic and has a giant heart. He loves to play basketball and skateboard, almost as much as he loves his dog. He loves his family, in spite of it all. He's a loyal friend, and a peacemaker. He tries hard to please, and surprises us with the good choices he makes. He does his work, sometimes with a little prodding from my wife and/or myself, but almost always with a great attitude. He loves music, taking up clarinet and guitar. He loves to draw and to create. And he's good. I'm sorry, son, for the bad things I've put you through. I love you and I'm so very proud of you. You're a great kid, and I wish I could put into words how much I love you and how much hope I have for your future. God be with you, Nicholas, as you turn this page on your life. Happy Birthday, Nick! I remember when I turned 14 and was sure that I knew everything there is to know in the world. The world wasn't scary to me anymore and I was counting the days until I turned 16. Your parents love you so much, and they're super lucky to have you! Have fun with your braces :) Enjoy this year! Hi Nick... it's your Eskimo buddy Ken V! I wanted to wish you a BLESSED and HAPPY BIRTHDAY! This is the day we celebrate... when God breathed life into your being and offered you as a gift to the world! Wishing you ALL God's best!